An absoloute age ago I knitted a pair of slippers from a French Press Knits pattern. The pattern requires some felting and sadly in the UK we tend to have front, rather than top loading machines. The results when using a front loader, I understand, can be very mixed. I decided therefore to felt by hand. I had a look on you tube for some advice on the matter and it seemed simple enough. So out with the soap and rubber gloves, kettle on boil. Well, I can safely say I wish I had gone out and bought a front loading machine, or a pair of slippers from Ruby and Ed these ones are nice…. 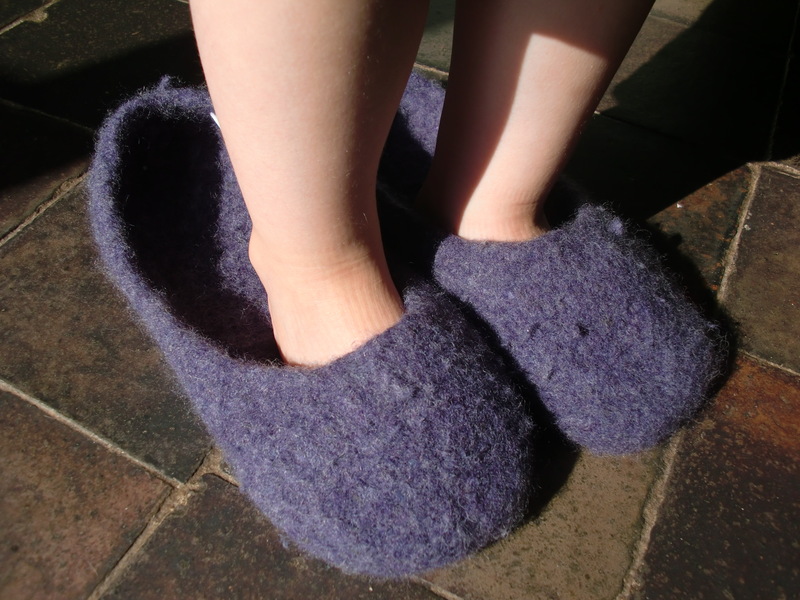 Felting these slippers by hand took an age. I would tell you how long but my husband might read this! Many many boiled kettles later I eventually got them almost to the right length. In the unusually warm weather we have been having they dried off quite quickly. They are a little on the loose side, but I am hoping that an insole might help.